Yo Joe! That had to be done. This week I present something that goes back to my childhood (waging huge Joe vs. Cobra wars) but also represents a current interest (collecting Joes). My choice for cover of the week for this week is the photo variant cover for G.I. Joe #8. This is one of IDW's G.I. 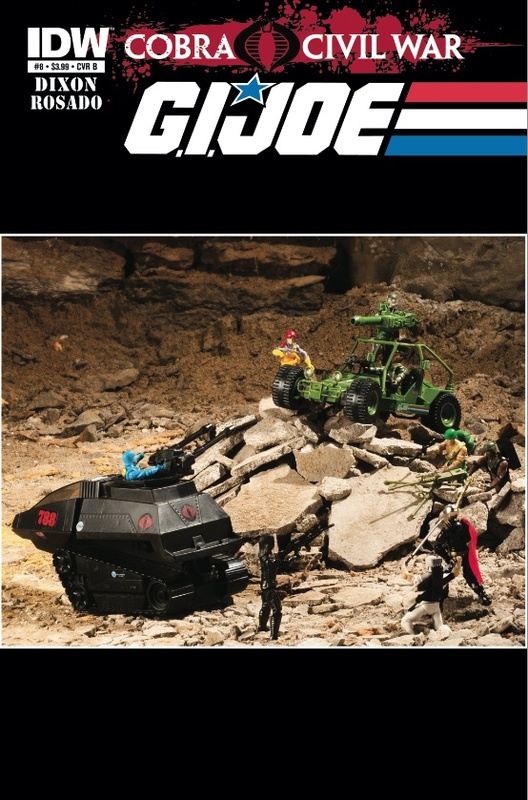 Joe toy covers showcasing some plastic Joe vs. Cobra action. Check it out. This cover features Stalker driving the A.W.E. Striker with Scarlett firing from the side along with Roadblock and Duke. Opposing them is Cobra Commander in a Hiss Tank along with Baroness, Storm Shadow, and Destro. Classic characters (figures) and vehicles. I will admit it's kind of odd they have vintage figures mixed with 25th Anniversary/Modern Era ones. But they got the same effect. Sorry Snake Eyes fans (myself included), he is absent from the picture. But then again, it's Snake Eyes, he could be hiding in front of the Hiss ready to strike. Like it? How can you not? Let me know what you think. Thanks for looking. Oh, and one more thing...YOOOOO JOE!